By Golly, it's time to be Jolly!! The most awaited time of the year is finally here! The heavenly dazzling twinkles blanket the world, so are the faces brightly lit. There is such harmony in the air that brings inner peace to all of us. The smile on our faces says it all. PartyBell joins in the celebrations and wishes everyone season's greetings. Christmas is no fun without the little elves working days and nights giving our presents a glossier look. Turn into an adorable elf with this vibrant costume. 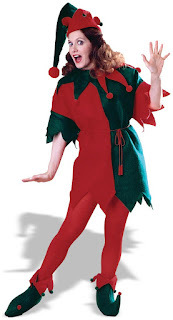 It includes red and green tunic, belt-cord, matching hat and elf shoes with little pom poms. Be dear Santa's favorite red-nosed Rudolf, the reindeer. The costume one piece suit made of brown acrylic pile plush with a white acrylic pile plush front tummy and a zippered back. It is a complete costume. You don't need to buy anything to complete the look. There is open-faced hood, antlers, red nose, mitts and shoe covers. 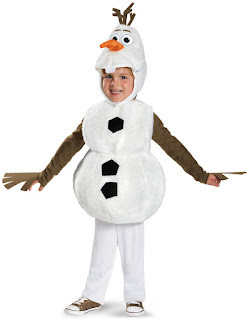 This olaf costume for your little one is a jumpsuit with plush overlay and soft character headpiece. This is an officially Disney Product. Make your precious one a part of the Christmas celebrations. 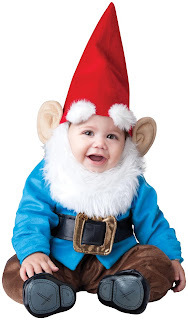 The costume is a jumpsuit with attached belt, hat with attached ears, eyebrows and detachable beard and booties. And ofcourse, the Santa suit! The signature red and white Santa costume includes jacket, pants, hat, belt, boot tops, gloves, glasses, eyebrow sick, wig and beard set. Pump up that pot-belly and say Ho Ho Ho! Dig in PartyBell and find your favorite to brighten up your celebrations.